Shanghai’s IAAF Diamond League meeting on Saturday (18) produced meeting records in four events and nine world leads, the latter topped by a stunning win by China’s Li Jinzhe in the Long Jump ahead of the past three Olympic champions. The rain which had tumbled down in the previous few days stopped – a brief shower as the evening’s events got under way excepted – allowing the meeting to proceed in fine, still conditions. If the presence of the London, Greg Rutherford; Beijing, Irving Saladino; and Athens, Dwight Phillips, champions did not bother Li Jinzhe, however, he would probably not have cared had the rain kept falling. He led at the completion of a cautious first round with 7.91m, at the end of the second with 7.93m and the third with 8.20m. Li’s winning distance of 8.34m came in the fourth round and he passed his final two attempts. He had to watch nervously as Aleksandr Menkov produced a big last-round effort, but when the jump was measured at 8.31m, victory went to Li. Li missed the Chinese national record 8.40m, set by Lao Jianfeng back in 1997, by just six centimetres. No problem, he will try again at the Beijing World Challenge meeting, he said. After that, “I will try to win a medal at the World Championships,” said the 23-year-old, who now goes to fourth on the Chinese all-time list. The other world leads came from Kirani James in the 400m, Shelly-Ann Fraser-Pryce in the 100m, an (outdoor lead) from Francine Niyonsaba in the 800m, from Genzebe Dibaba in the 5000m, Conseslus Kipruto in the 3000m Steeplechase, Zuzana Hejnova in the 400m Hurdles, Caterine Ibarguen in the Triple Jump and Tero Pitkamaki in the Javelin. 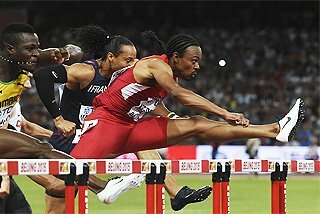 There was also injury drama, with Olympic champion and World record-holder Aries Merritt pulling up before the first hurdle in the 110m Hurdles, Carmelita Jeter exiting the track on a stretcher after finishing third in the 100m and Rutger Smith suffering a severe leg injury in the Discus. Merritt pulled up largely as a precautionary measure after feeling cramping sensations in his right hamstring in the warm-up. The race was won by 2011 World champion Jason Richardson in 13.23 from Ryan Wilson (13.25) and Xie Wenjun (a personal best 13.28). 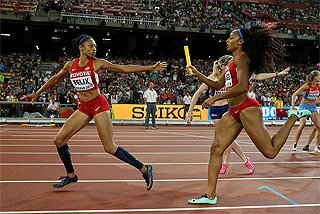 Jeter clutched her thigh as she hobbled through the last few steps of her 100m, won by Shelly-Ann Fraser-Pryce in a world lead of 10.93. Smith fell in the Discus circle and it is feared he may have ruptured an achilles tendon. The men’s Long Jump was one of several quality events in Shanghai. Kirani James has carried all before him the past two seasons, winning the World Championships and Olympic titles at a precociously young age. Things do not get any easier, however. Here he faced London minor medallists Luguelin Santos and Lalonde Gordon, as well as former World and Olympic champion LaShawn Merritt. James had made up the stagger on Merritt as they came onto the final bend. Briefly the pair ran in step before the young Grenadian pulled away to win in 44.02. Merritt beat Santos for second, 44.60 to 45.11. James’s time equalled the meeting record set by Jeremy Wariner in 2007 and is the fastest ever 400m time witnessed at a Diamond League meeting. 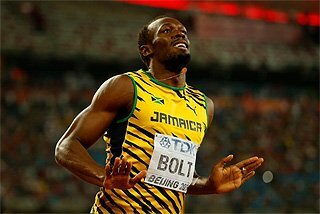 James is the only non-US athlete to have broken 44 seconds for 400m and he has started 2013 in the same manner he finished the Olympic year. 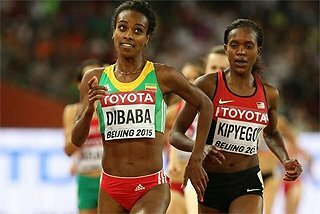 The women’s 5000m pitted Olympic champion Meseret Defar against Ethiopian teammate Genzebe Dibaba and Kenyan pair Sylvia Kibet and Viola Kibiwot. Defar led into the final lap before Dibaba produced a stunning burst with 200m to go. She sprinted clear to complete a 59-second final lap and win in a world lead of 14:45.92 from Defar (14:47.76) and Kibiwot (14:48.29). 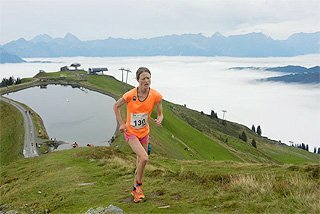 Eight women broke 15 minutes. 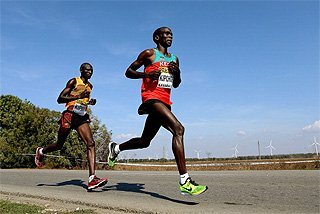 Asbel Kiprop seems to be condemned to run interesting races. This time, he snatched a last-stride win in the 1500m from Mekonnen Gebremedhin, 3:32.39 to 3:32.43, but only after going from third early in the race to mid-field in a field of 16 with a lap to go. 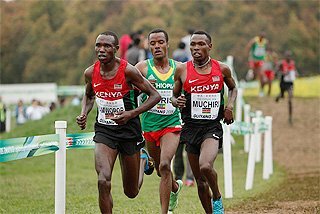 At the bell, Kiprop was giving the leaders – including Silas Kiplagat, Abdelaati Iguider, Nick Willis and Gebremedhin – 10 metres. 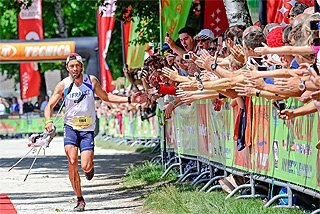 But he closed down the back-straight then surged off the final bend to pass his rivals one by one. Collins Cheboi took third place in 3:32.96. Willis fell as he clipped Kiplagat in the straight but got up to finish 13th in 3:40.72. There were also world leads in the men’s Steeplechase and women’s 800m. World junior champion Conseslus Kipruto out-pointed Paul Kipsiele Koech and Hillary Yego over the last lap to win in 8:01.16, also a meeting record. It consolidates his position at No.2 on the world junior all-time list and puts him just two-and-a-half seconds away from the World junior record. Francine Niyonsaba impressively won the women’s 800m in 2:00.33, ahead of Janeth Jepkosgei and Malika Akkaoui. An 87.60m world lead took 2007 World champion Tero Pitkamaki to a narrow victory in the men’s Javelin. The Finn had previously held the world lead at 86.40m. Second-placed Vitezslav Vesely threw 86.67m to also better the previous world lead while Dmitriy Tarabin threw 85.36m for third. Olympic champion Keshorn Walcott could manage no better than 79.02m for sixth, while his predecessor in 2004 and 2008, Andreas Thorkildsen, failed to register a valid throw. Mutaz Essa Barshim beat Bohdan Bondarenko in the men’s High Jump on count-back, clearing 2.33m on the first attempt as against Bondarenko’s second. In Doha last FridayBondarenko won from Barshim, so the two now lead the Diamond Race with six points apiece. 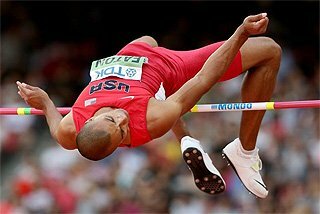 The pair also equalled the meeting record of 2.33m set by Yaroslav Rybakov in 2006. Yelena Isinbayeva took only two jumps to win the women’s Pole Vault, running under the bar at her first attempt before soaring over 4.70m on the second. That left her well clear of Mary Saxer’s personal best 4.60m and Silke Spiegelburg’s 4.55m. 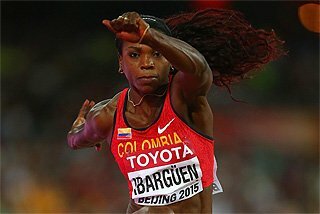 Caterine Ibarguen started the women’s Triple Jump with 14.35m, a distance immediately topped by her closest rival, Olha Saladukha with 14.43m. Christina Schwanitz wasted no time in setting down new markers in the women’s Shot Put. 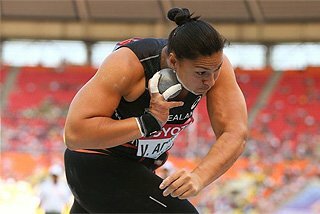 With her first throw, the 27-year-old German landed the shot at a personal best 19.76m, with her second she cracked the 20m mark with 20.12m and with her fifth she was again in new territory with 20.20m. Three personal bests for the competition and a final mark close enough to Valerie Adams’ world lead 20.37m. It may be a little premature to suggest Schwanitz can challenge the indomitable Adams, but she certainly has shaken up the world order. 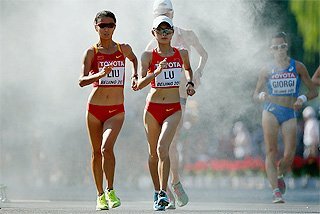 Shaken in Shanghai was Gong Lijiao, a bronze medallist at last year’s London Olympics and a fixture in the top five at global championships since the Olympics before that in Beijing in 2008. Gong took second with 19.73m. There were no such shocks for Piotr Malachowski. The favourite led the men’s Discus after three rounds with his 64.33m then exploded to a 67.34m in the fourth round, a distance bettered this year only by Australia’s Benn Harradine who threw 68.20m in Townsville on 10 May. Beijing Olympic champion Gerd Kanter was second with 63.14m and Robert Urbanek third with 62.85m. Olympic bronze medallist Warren Weir won the 200m in 20.18 from the fast-finishing Justin Gatlin (20.21) and Jason Young (20.22). In the women’s 400m Hurdles, Zuzana Hejnova finished strongly to beat Angela Morosanu, 53.79 to 53.85, both under the previous world lead.